The iPhone 5 is here - can it leap ahead of the pack? The iPhone 5 is here - but can it leap ahead of the pack? After all, we've seen some pretty brilliant handsets released recently, including the iPhone 5's two current biggest rivals, the Samsung Galaxy S3 and the HTC One X. At the recent Nokia World event we also had the announcement of the Nokia Lumia 920. It's a huge deal for both Nokia and Microsoft and both have a lot riding on its success. Many see it as Nokia's big throw of the dice: make Windows Phone 8 into a top OS and the rewards are huge... fail, and things look ropey for the Finns. The Lumia 920 features Windows Phone 8. Can it succeed? Of course, as well as hardware, there's is also a battle between iOS 6, Android 4.0 and Windows Phone 8. So without further ado, let's compare the specs of the four handsets and give our early view on which is the front runner. The Nokia Lumia 920 comes running Microsoft's latest version of its mobile OS, Windows Phone 8, complete with its interactive "Live Tiles" interface, which has changed a lot in the latest version. 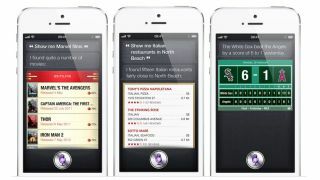 The new iPhone 5 features iOS 6 - the next generation version of Apple's mobile operating system. It includes Passbook - Apple's new e-tickets app - plus FaceTime over 3G (depending on the network) and Apple's own mobile apps including turn-by-turn navigation (which has ruffled a few feathers for companies like CoPilot and TomTom). Both the One X and the Galaxy S3 run Android 4 (Ice Cream Sandwich) with custom user interfaces; Touchwiz on the S3 and Sense 4.0 on the One X. Samsung has said that it plans to update the S3 to 4.1 (Jelly Bean) before the end of the year. HTC has also promised its arrival, but has yet to name a timeframe. Nokia has opted for a dual-core Snapdragon S4 chip clocked at 1.5GHz, with Nokia standing firm on its belief there's such a thing as too many cores. Why, might you ask? As Nokia puts it, "why put something you don't need at the expense of battery life?". However on the 'bigger is better' side of the fence, Samsung pops one of its Exynos 4412 1.4GHz quad core's in to Galaxy S3, whereas HTC plumps for the quad core 1.5 GHz Nvidia Tegra 3 chip. However, in the US it's a different story (weird, you might think, but it's a 4G LTE thing) as the Samsung and HTC handsets also run the same Snapdragon S4 chip as the Nokia. The iPhone also sticks with Nokia in terms of its core count - two cores reside inside the new Apple A6. It has twice the CPU speed and twice the graphics power of the A5 - the chip is smaller and is more battery-friendly and is based on the new-ish dual-core ARM Cortex-A15 CPU design. In terms of size, only the iPhone 5 resists a truly huge screen - replacing the 3.5-inch screen with a 4-inch 1,136 x 640 16:9 version. By contrast, the Lumia 920 measuring in at 4.5 inches, the Galaxy S3 at 4.8 inches and the One X at 4.7 inches. All four screens are truly impressive, with the Samsung's 306ppi being pipped by the HTC's 312ppi and the iPhone 5 (and 4/4S) dis[play clocking up 326ppi. On the Lumia 920, Nokia have put in 'Nokia PureMotion HD+' which is supposedly better than HD in terms of screen performance. We still can't feel we weren't as 'wowed' as we were when looking at the Super AMOLED HD of the Galaxy S3 - or, indeed, the first time we saw an Apple retina display. In the Lumia 920 you'll find 32GB of on board storage, backed up by SkyDrive, Microsoft's cloud storage system. The Galaxy S3 comes with microSD support on top of Samsung's 16/32/64GB internal drive - the same internal flash memory sizes as the iPhone 5. Like Nokia, HTC opted to only go for 32GB internal storage. However, the Samsung and HTC handsets come with 50GB and 25GB of Dropbox storage respectively.